Shedding their differences, the NDA tonight resolved to get the controversial anti-terrorism Bill passed with a “resounding” majority at the joint sitting of Parliament, even as alliance partners asserted the Vajpayee Government must not deviate from the agreed agenda. 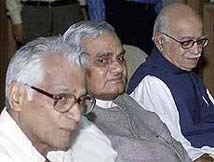 Prime Minister Atal Behari Vajpayee (C) sits with Defence Minister George Fernandes (L) and Home Minister L. K Advani as they meet with NDA co-ordinate committee members in New Delhi on Friday. Should Gujarat CM Narender Modi be removed? President K R Narayanan today summoned a joint sitting of Parliament to deliberate and vote on the Bill seeking ratification of the Prevention of Terrorism (second) Ordinance, 2002, which, the government said, would be held on March 26. News of an attack on another train sent shivers through Gujarat this morning. An armed mob of about 500 reportedly tried to stop a Mumbai-bound train at Vadodara city late last night. In video: Curfew continues in parts of Ahmedabad, a day after nearly 90 shops were gutted following fresh communal violence. The Vishwa Hindu Parishad today denied that it had ever announced the holding of an “asthi kalash yatra” carrying the ashes of those killed in the train carnage at Godhra last month. The USA has asked Pakistan to hand over to India 20 wanted terrorists, saying the step will lead to reduction in tension between the two countries. World page: Is Pervez hoodwinking the world? Nine Pakistani soldiers were killed and 12 of their bunkers destroyed in heavy artillery firing along the Line of Control in the Rumblidhara and Kalaal areas in the Nowshera sector of Rajouri district today. Over 52 persons, most of them civilians, were injured in two grenade explosions in Pulwama and Anantnag districts of South Kashmir today. Elsewhere, at least five militants were killed in separate encounters with the security forces in the valley since yesterday. In video: Two militants have been killed in a fierce encounter with the security forces in Kangan, 40 km from Srinagar. Dr Kewal Krishan was elected the Speaker of the Punjab Vidhan Sabha here today. The Leader of the House, Capt Amarinder Singh, proposed his name and the Minister of Parliamentary Affairs, Chaudhary Jagjit Singh, seconded it. Since the Leader of the Opposition, Mr Parkash Singh Badal, had already stated that the election should be unanimous, no other name was proposed. Shahidon ki chitaon par lagenge har baras mele, Vatan par mitne walon ka yahi baaki nishan hoga..... These blood curdling lines that remind us of the tales of bravery of the Independence struggle barely hold significance any more. The martyrs are well remembered by the politicians either on paper or in the political conferences that are organised to gain publicity.